One of the bits of advice I have had from the physiotherapist is to try and keep active during my cycling injury rehabilitation. Keep my heart rate up to help improve the blood flow to the healing olecranon fracture. The best thing, is they are happy for me to do that on Zwift! 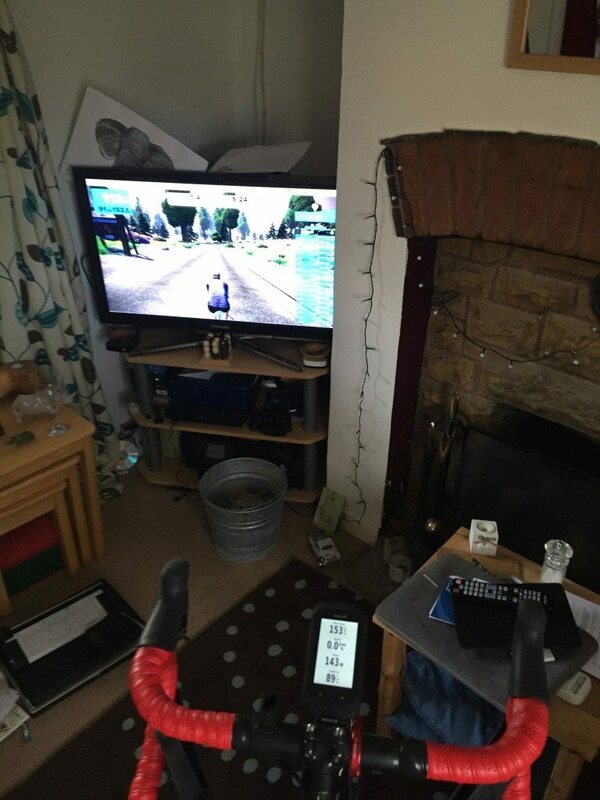 This is has been a slightly delayed posted – as while I have had permission to get onto the Wahoo KICKR and go Zwifting, actually doing so turned out to be a much bigger step for me than I have considered! 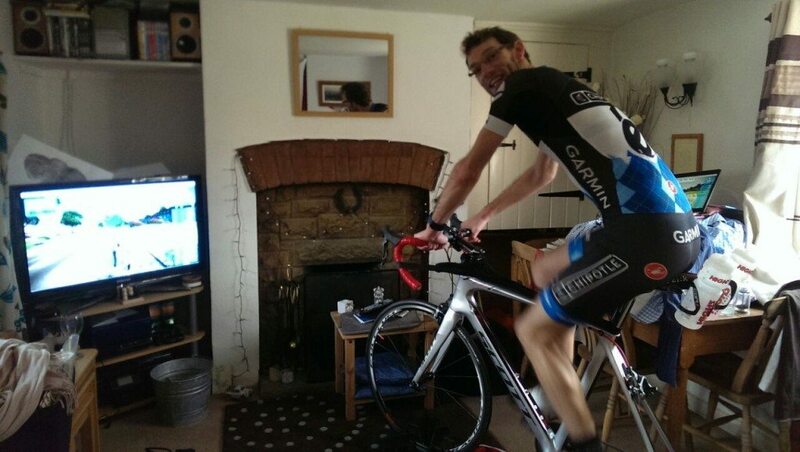 Let me be honest, getting back on the bike, even though I was told I could use Zwift, was hard work. Not physically hard work, but mentally hard work. 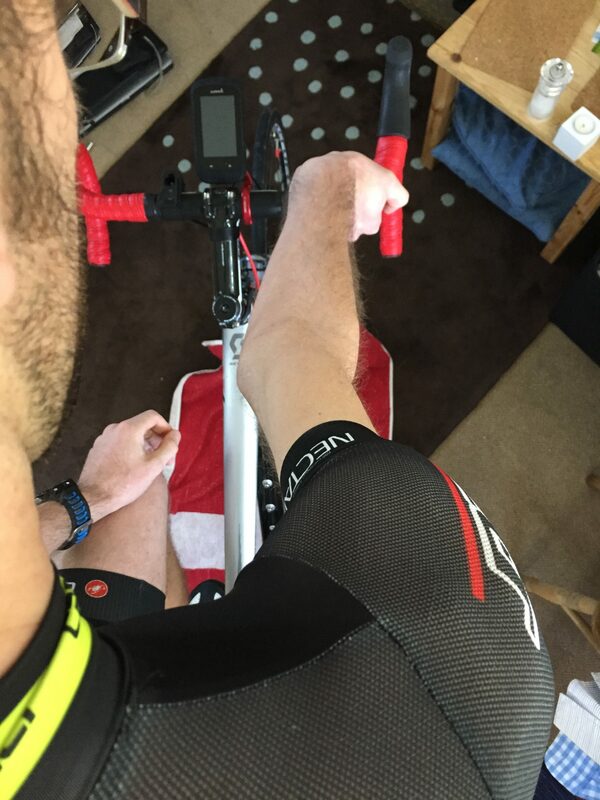 Even though the height increase for my elbow is only increased by about 1-2cm getting onto the KICKR, that’s still quite a height when you are one arm down, and feeling rather… vulnerable. I appreciate that the Wahoo KICKR is probably one of the most planted turbos you can buy, but my ability to move quickly, for example, to stop a fall, was almost zero. Combined with a lot of fear, this wasn’t a good way to try and get back on the bike in any shape or form! It actually took me several weeks after I told I was allowed cycling indoors to actually pluck up the courage to get back on it. 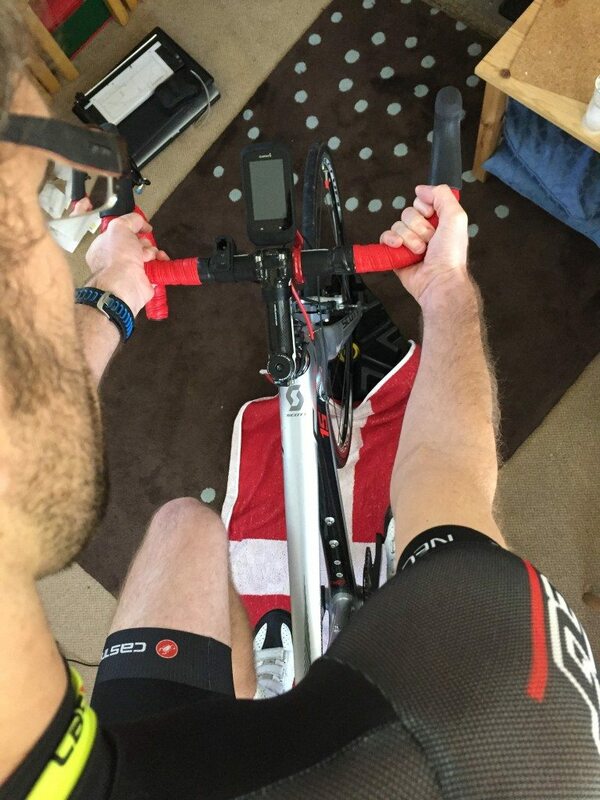 Just the mental concern of potentially falling off the trainer was very frightening, and I was surprised about the number of things which could trigger that fear response. Thankfully the Wahoo KICKR is built like a tank when I actually plucked up the courage to get back on the bike I knew I’d actually have to be trying to knock the bike over in order to get the turbo to move. But when has rational thought ever been able to overcome a fear? With the Wahoo KICKR in place, Zwift booted up, and the front wheel secured I was sufficiently happy to get back on the bike! By using Zwift, and the KICKR, I was able to get my heart rate up, admittedly only gingerly to 120-130bpm – and things happened exactly as had been suggested by the physiotherapist. – Specifically, the swelling or oedema in my fractured elbow began to settle. The idea being as you increase your heart rate, so the flow of blood the injury ALSO increases, helping move the fluid out of the tissues, and crucially supply the healing elbow fracture with increased nutrients. This was backed up as I actually found that I was able to move the arm slightly more after having done a Zwift session compared to just doing my physiotherapy exercises normally. The enabled me to move a little bit further with my stretches and was reflected the following week by the physiotherapist, who was impressed with my increased range of movement. Initially, when doing stretches at the elbow, you are using your unaffected arm to stretch out the broken one. However, as the muscles on the broken arm gradually loosen, the force you need to apply to the affected arm in order to straighten it begins to increase – I’ve now reached the stage I’m causing a bruise on my forearm from gripping things. So it then became an issue of how can I stretch the arm more easily?? 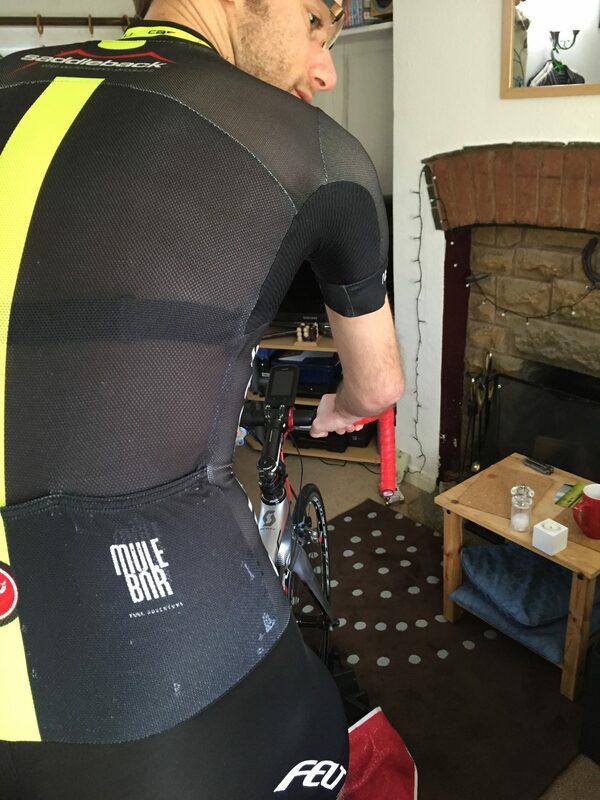 I tried suggestions such as pushing against a flat wall, or doing biceps stretches against the table, just wasn’t working for me – then I thought about people “locking out” their elbows when cycling, and a lightbulb came on! So the theory of trying to do bicep stretches pressing against the handlebars is good in theory – but again fear is an issue – I still can’t fully lock my arm out, it feels as though my arm will collapse inwards. Which could potentially cause a significant injury to my healing fracture site. On my first KICKR ride, I noticed it was a stretch to reach the bars initially with my RIGHT hand. In the above picture you can see how the arm doesn’t fully straighten when asked to, so leaving me to unconsciously bending over to cover the distance to the bars. Certainly this didn’t look like it was going to be compatible with getting out on the road again! However, when stretching my RIGHT arm by using my good LEFT arm, the arm straightens much more than I can with the arm alone. I quickly realised the same thing was possible on the bike. – Performing stretches whilst also doing cardiovascular training. Slowly but surely cycling injury rehabilitation is working! 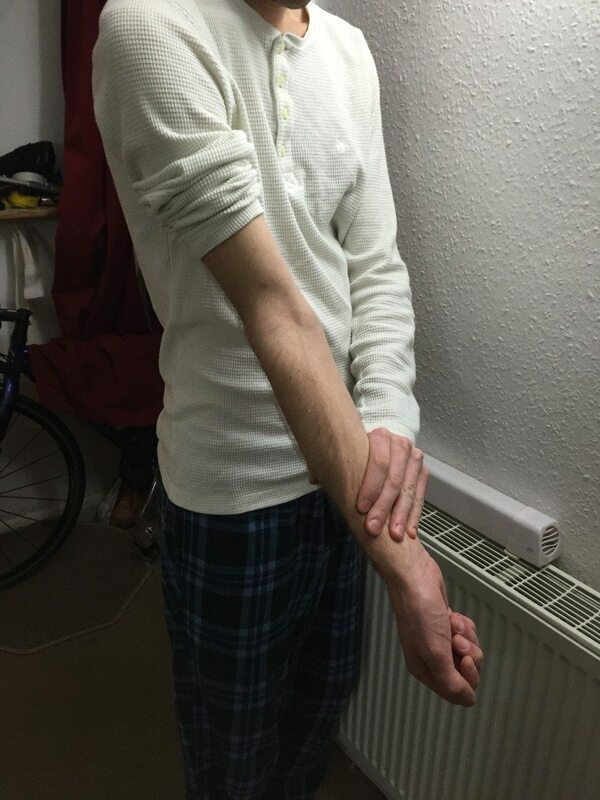 I genuinely feel that the extra force I have been able to put through the arm to straighten it has had a great effect on the degree of extension I have managed to get back so far. 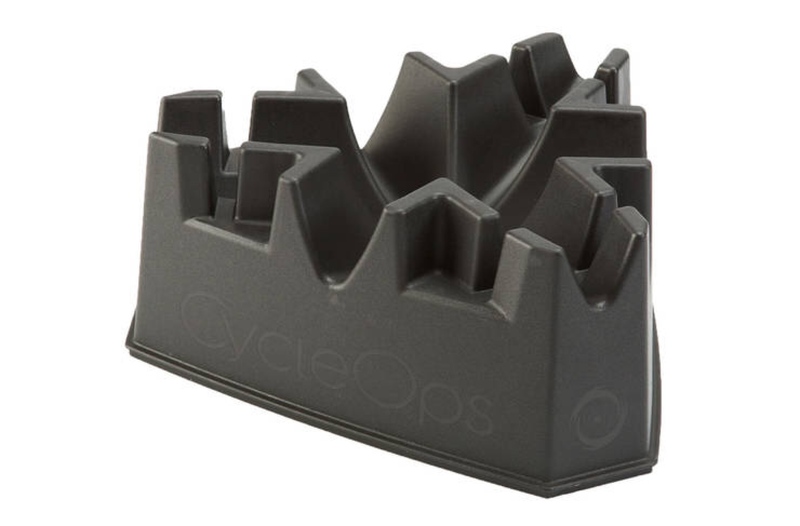 Also by griping the bars firmly, both when doing my Zwift rehabilitation sessions I have found the grip in my RIGHT hand seems to have improved significantly as well. 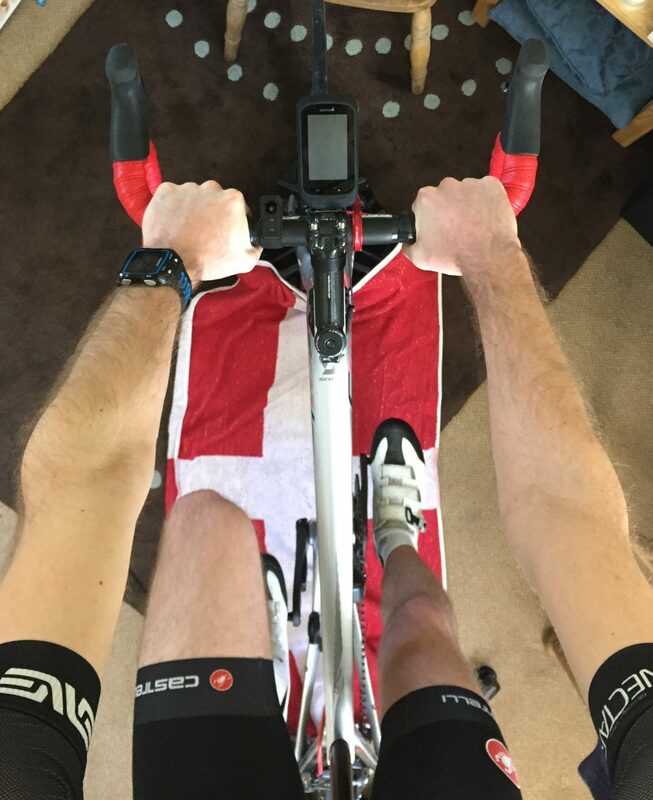 Using Zwift here has really been a great benefit to me mentally. The challenges and things, not that I’m really able to push hard currently, but they are meaning I’m actually wanting to spend time on Zwift and using the KICKR! This is something I’ve never experienced before! Plus doing little spins of the island, is giving me something additional to aim for compared to just sitting spinning my legs for set time periods. Hopefully I’ll be out on the bike for real before long! 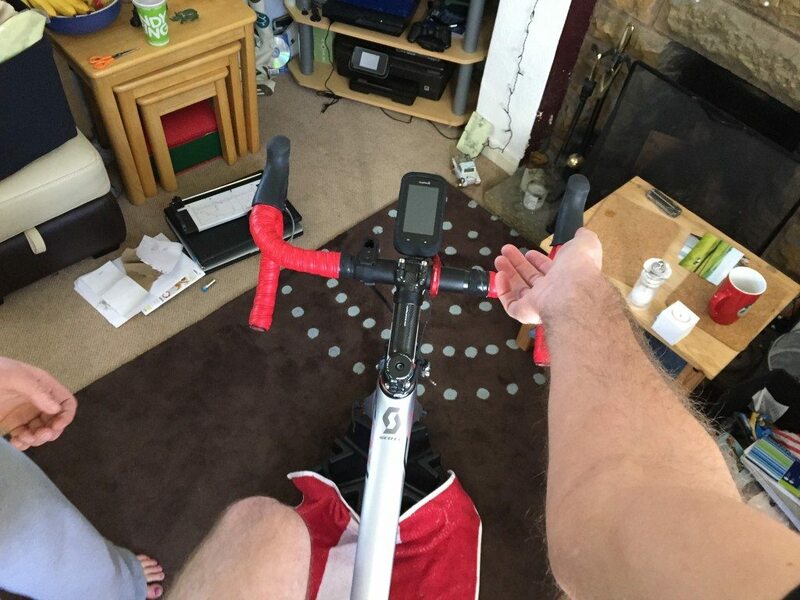 Wahoo KICKR Climb Review – Are We At Peak Gadget?